The king of retail is on the road to recovery, but there may be obstacles ahead to derail its efforts. Wal-Mart (NYSE:WMT) has seemingly turned a new leaf as the megaretailer suddenly embraces many of the reforms its critics have demanded over the years. Yet despite initiatives to raise employee wages, stock more ethically sourced food and goods, and be a better corporate partner overall, critics continue to uncover new headaches, some of which just might pose problems for the company down the road. Wal-Mart made big headlines earlier this year when it announced that after years of union protests, it would raise the minimum wage paid to its employees to $9 an hour immediately, and then increase it again to at least $10 an hour next year. The company "raised the floor and ceiling on pay bands" for employees who are not in entry-level positions, meaning a half-million workers got a raise this year. Wal-Mart also added more cashiers to speed customer checkout, is putting some 8,000 department managers on the floor as part of its $1 billion effort to enhance the consumer experience, and just announced it would return greeters to its doors, in part to help cut down on theft. Although it is just beginning to post consecutive quarters of rising comparable sales, an important retail metric that measures organic growth that does not come from opening new stores, it is an anemic improvement (up just 1.1% in the first quarter). These investments in its employees could eat up any profit and margin gains those higher sales generate. Bloomberg reported that Wal-Mart has squirreled away some $76 billion in assets in offshore tax havens. A study by the United Food & Commercial Workers International Union found the retailer saved $3.5 billion in income taxes over the past six years by using loopholes to hide profits abroad. For example, the study pointed to Luxembourg, where Wal-Mart operates no stores (but does keep offices to help run its international operations) and still managed to report profits of $1.3 billion between 2010 and 2013, yet paid taxes at a rate of less than 1%. Many companies, including Apple and Google, have been accused of sheltering income from taxes in foreign locations -- what Bloomberg called "mailbox subsidiaries" -- while others have resorted to fleeing the U.S. by buying foreign companies and incorporating abroad, performing what is called an "inversion." While the U.S. Treasury Department clamped down on inversions, making such deals more difficult, Wal-Mart and these other corporations are still fully compliant with U.S. laws and tax code. While these are symptoms of the onerous U.S. corporate tax structure, the involvement of Wal-Mart could spur politicians and regulators to change the laws or even pressure the retailer to repatriate those profits. 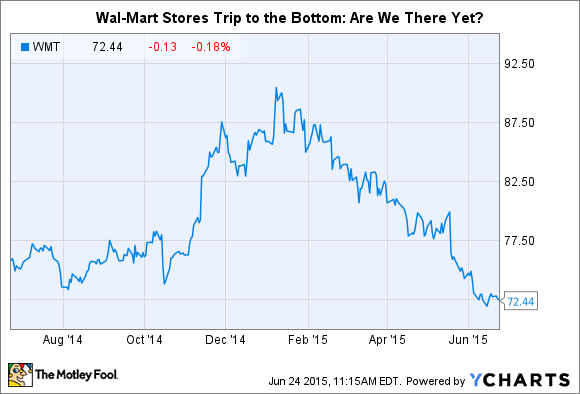 Wal-Mart has also found itself under attack from all sides. And it is not just activists and labor unions but competitors as well. Rivals like Kroger and Costco have poached customers from Wal-Mart, which has seen revenue rise at a far slower rate than its competitors. Wal-Mart is trying to win back those consumers by improving the shopping experience (the investment in its employees is part of that effort) and opening up smaller-format Neighborhood Market stores. These locations are resonating with customers, as comps jumped almost 8% last quarter. But its rivals are not standing still, either: Target is opening small format stores of its own, and Kroger has bulked up its organic foods offerings as has Costco, which is now the biggest seller of organic produce and is expected to hit $4 billion in sales this year. And European supermarket chains Ahold and Delhaize, which operate the Food Lion, Stop & Shop, and Giant chains, just agreed to a $29 billion merger. 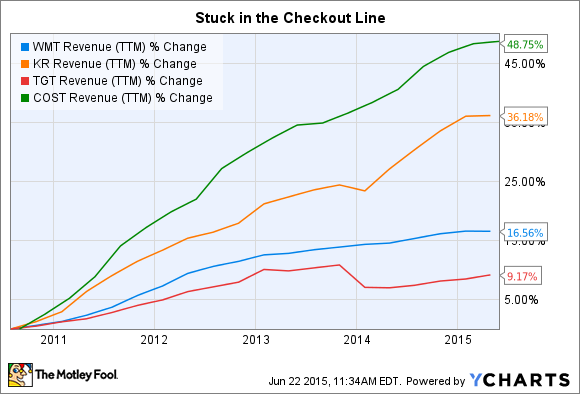 There is a turnaround taking place at Wal-Mart, but it is only just beginning. Investors should be encouraged by the changes under way, but be mindful that it is still precariously balanced and any hiccups could send its stock tumbling.